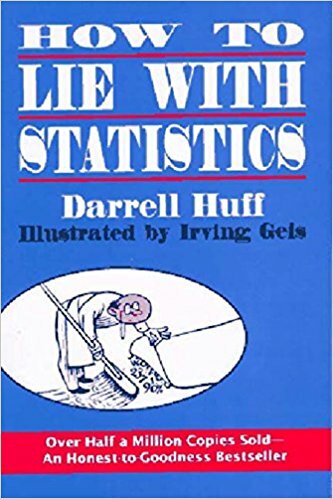 The book is a fantastic primer on how we’re tricked, daily, by the sneaky use of statistics. It’s a must-read for anyone to more intelligently interpret news, media, and even medical research. Once you learn to see these tricks, you cannot unsee them. Don’t be fooled by missing data: Just because taking a drug clears up a cold in one week doesn’t mean that it wouldn’t have cleared up in a week on its own. Many conclusions you see come from samples that are too small, biased, or both. When you hear a statistic, say, that the average American brushes their teeth 1.02 times a day, ask yourself: “How could they have figured it out?” Does it make sense that it could have been researched effectively? In this case, they would have had to ask, and don’t you think it’s a safe assumption people lied? If a psychiatrist says that “practically everyone is neurotic,” do you suppose that their impression has been biased by their line of work? These can be very different numbers, and reporters and others will pick the one that best supports their argument. In normal distributions, the three will be near each other, but in irregular distributions (e.g. annual household income) you’ll get vastly different numbers for each. With smaller samples you have larger variance. With 10 coin flips you might get 8 heads, but you’re much less likely to get 80 heads in 100 coin flips. These five questions help you avoid getting tricked by statistics. Is that the real statistic, or what someone reported? (e.g. how often they bathed).